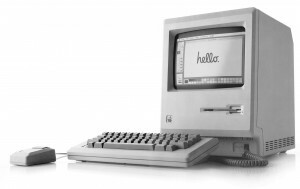 When Steve Jobs presented Apple’s Mac computer in 1984 to shareholders for the first time, the personal computer industry was almost nonexistent and that began to change with the Macintosh. Although everyone knows of the first presentation that Steve Jobs gave in early January 1984, a never before seen video of his second presentation of the first Mac has surfaced. Since this presentation was intended for regular users and was given for the Boston Computer Society, it was actually more polished than the initial unveiling which was meant for people primarily interested in how the Mac was going to make Apple more money. This is the first time that the video has been available to the public since it was shot by the Boston Computer Society on January 31. Throughout the 30 minute video, Steve Jobs unveils the computer that in many ways changed the entire industry and made personal computer possible. For the most part, this presentation was very similar in script to what Steve Jobs said during the Cupertino shareholders meeting six days earlier. However, because the attendees in Boston were the people that Apple was actually targeting and hoping to get interested in buying the computer, rather than people who were already invested in the company and were not necessarily users of Apple’s products. At the Boston Computer Society presentation, practically anyone who was interested in seeing Steve Jobs was able to show up, and the regular $24 annual BCS membership was waived. So, in some ways, this Mac unveiling was one of the last presentations given by Steve Jobs that was meant for the general public rather than shareholders or members of the media. Even though the January 24, 1984 presentation was perhaps more important on the business-end, Steve Jobs’ second unveiling of the Mac truly allowed the company to reach out to actual consumers who were interested in the technology and how it would improve their daily lives. Summary: A video has surfaced from the Boston Computer Society of Steve Jobs’ second unveiling of the Mac computer, a video that has not been seen since the event itself on January 30, 1984.